View your P6 schedule in the only app developed by schedulers for mobile. Tighten your grip on the schedule. Get instant access to decision driving data. Take your schedule to site. Give access to your entire team. Collect status as it happens. View your schedule in the only app developed by schedulers specifically for your mobile device. 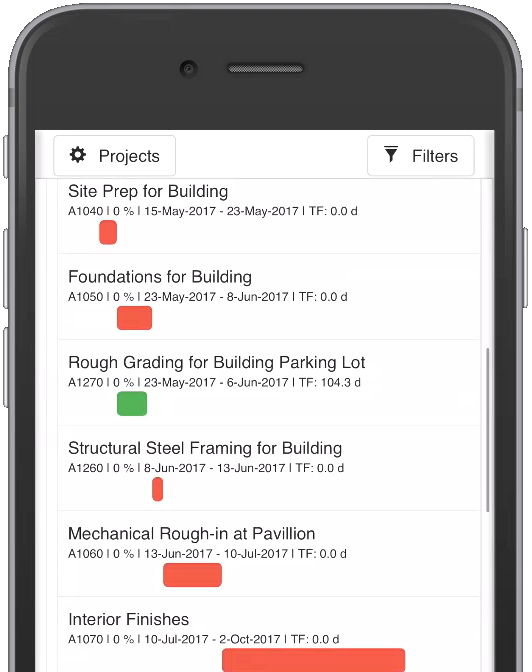 SiteWalker gives project teams the ability to share and understand the schedule, not just view the Gantt chart. Teams can view their project in a matter of minutes. Export a .xer file from Primavera P6, and load into SiteWalker. Regardless of the site’s connectivity, answers to your schedule questions are a couple taps away. 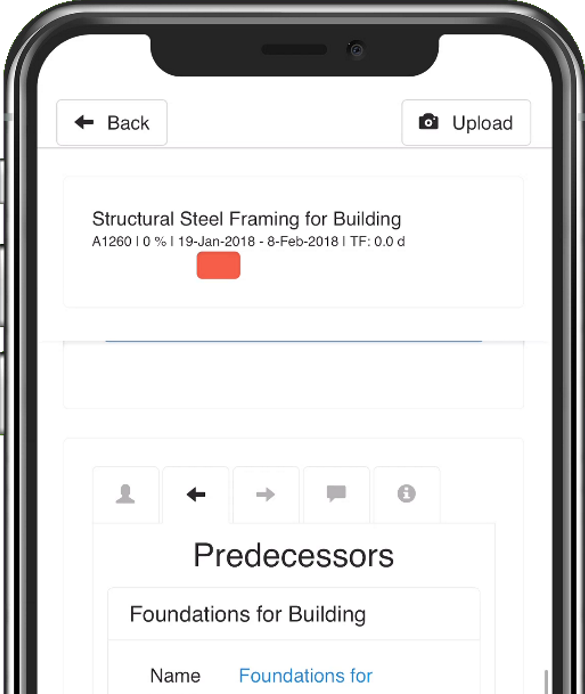 SiteWalker is designed from the ground up as a mobile user interface. Our innovative tools present users the activities the team needs to understand. Want to look at something more specific? SiteWalker has all the tools to group and filter your schedule. 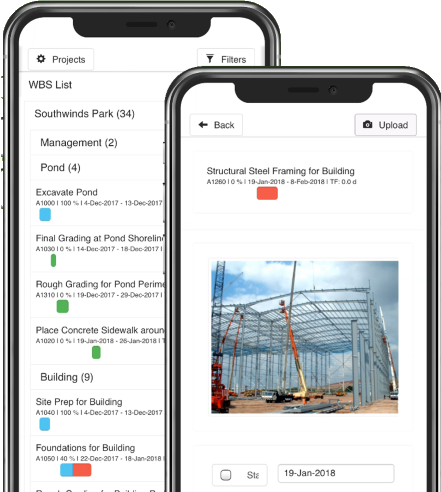 SiteWalker has all the tools to group and filter your schedule just like your favorite layouts in P6: WBS-expand and collapse, Activity Codes, Critical Path, 3-week Look Ahead, Resource Assignments. Get first hand updates. Not only can users update percentages and dates, they can also add pictures to bring the status and issues to life. Users can update: Progress, Planned and Actual dates, Pictures, and Notes. With 20 years of field experience, we understand the front line. And, we understand wi-fi and good cellular reception can be a luxury on-site. Make any project an offline project in the app and you’ll never know the difference. SiteWalker is easy to implement. Teams can take their schedule from P6 desktop to SiteWalker in a matter of minutes. Export a .xer file from Primavera P6, and load into SiteWalker. This creates an “airgap” between SiteWalker and your production database to eliminate IT security concerns. After field updates are completed, SiteWalker can provide an incremental .xer that includes only the needed activities to update the schedule in the database. 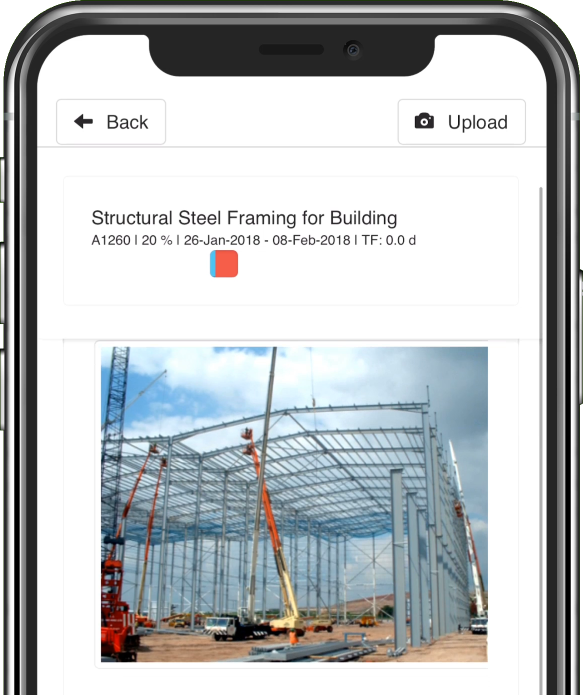 That means the office scheduler can continue to maintain the schedule in the database, while status updates and photos are collected in the field. 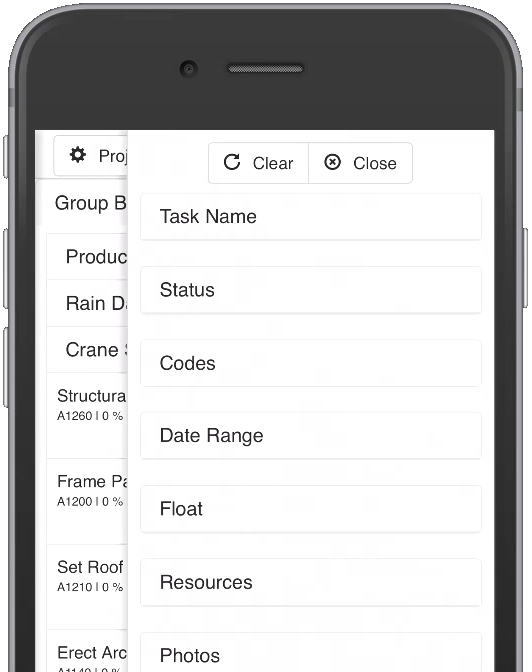 Powerful Group and Filter capabilities on our mobile Gantt chart. 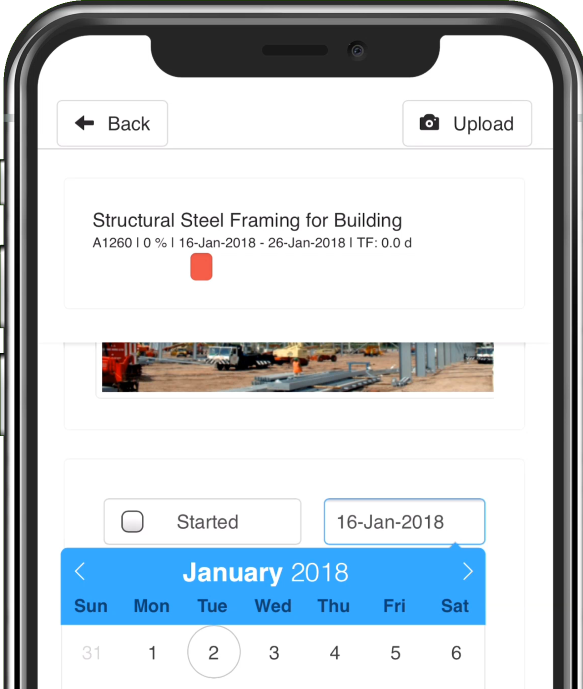 Gantt chart built for mobile. Remaining, Completed, Critical, and Milestone graphics time-scaled. Group your schedule by WBS, Activity Codes, Dates, Float, or Resource Assignments. 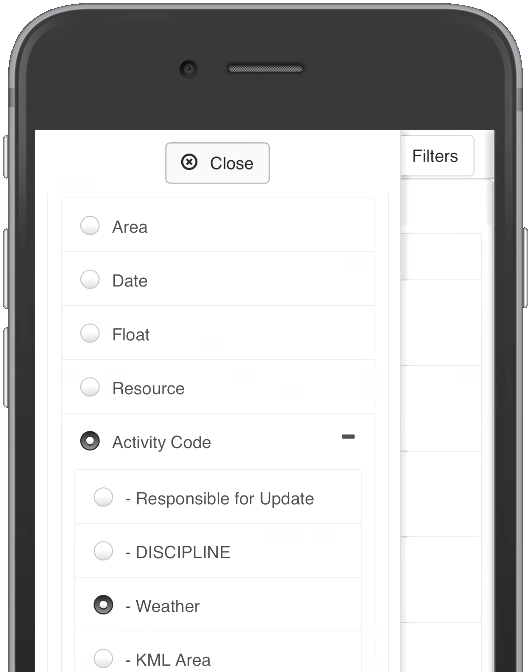 Filter by Name, Status, Activity Codes, Date Range, Float/Critical Path, Resources, and/or Photos. The devil is in the details, and that couldn't be more true of schedule data. Drill down into the data driving your schedule. Get your team into it so they understand the intricacies of the plan. Document progress or problems with pictures. Import them into P6 for your historical archive. Update actual dates, planned dates, and expected finishes. See predecessors, successors, resources, activity codes, and add your own notes. Our pricing is meant to make this a simple decision! As we are gaining traction, the use of SiteWalker is free. When we monetize the product, the pricing structure is shown below.